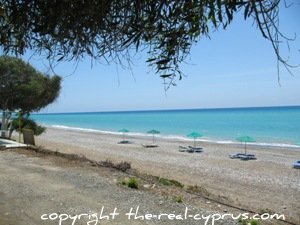 Pissouri restaurants by the beach are a wonderful place to have a coffee, a refreshing Keo beer or lunch when you are visiting Kato Pissouri or Pissouri Jetty as it will be signposted. Head on down past the vines towards the sea and you will be met with a beautiful view of the mediterranean sea. You will notice it has several shades of beautiful blue! You will most probably want to while away quite a few hours here so make sure you have plenty of reading material, a towel and don't forget the sunscreen. So where to go for lunch? 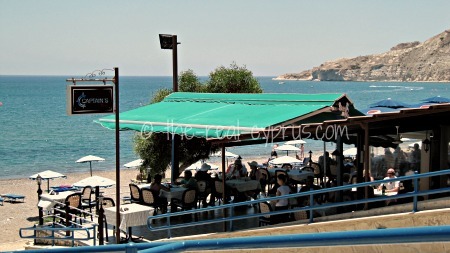 Which Pissouri Restaurant By The Beach Should You Choose? You have several options ahead of you and here are some of the most popular ones. 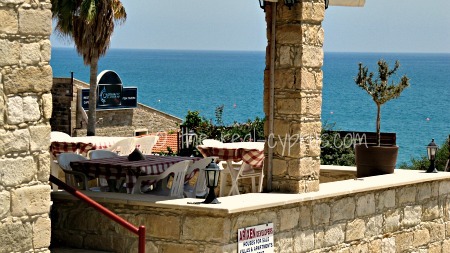 This restaurant has an amazing view, if not the best view of the beach in Pissouri. I don't have the details of the owner, or the phone number but I do know they must be doing something right, because over the years, they have expanded and developed and each time I pass the restaurant is full, especially at lunch time. 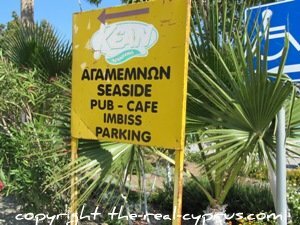 They serve traditional Cyprus food and seafood, their prices won't be cheap, they have prime real estate in the area but you are paying for a quintessential beachside restaurant and view with good food, because otherwise no one would be going...! If you head towards the sea and turn left at the lovely old stone beach house (signposted the beach house) and follow the road down and bear off to the carpark on the left you will find this sign. 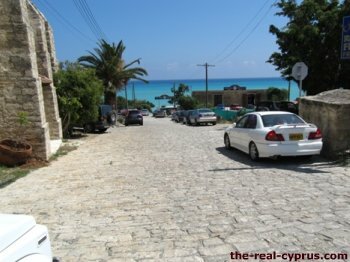 The road narrows but you just go along until you come to the restaurant, you will find parking on the other side of the restaurant. Androulla also has flats for rent as well, down past her restaurant. The menu is extensive in terms of cafe food, you can get some local kebab meals, salad is very popular, but what we go for is egg, halloumi and chips. ... and as you can see the view is pretty special too. Who wouldn't want to spend some time here? Here is a top tip if you go for lunch.. Although you won't know it, the owner of this cafe Androulla likes her visitors to clear the table themselves.. Owned by Athos for a number of years, this restaurant, so called because in the summer you sit under the cooling shade of the vine leaves. In the winter you have the luxury of a log fire when you dine inside. A very busy restaurant for lunch and dinner, it is very popular with the local cypriots so you might want to pop by and book a table for your Sunday lunch. In summer there is traditional music and dancing at the weekends and you are actively encouraged to join in, so make sure you have a couple of glasses of the local wine and then go for it. 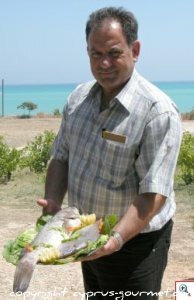 The restaurants meze is very tasty and extremely popular, however, if you just fancy a toasted halloumi roll for lunch, pop along to the Vineleaf during the day, it is well signposted on your way to wards the sea or if you leave the beach area via the Pissouri Jetty road. I remember when this restaurant opened, I think about 1986 or 1987, or thereabouts. I spent a lot of time at Pissouri when living at Akrotiri. Aristos and Demetris who are 2 brother in laws run the restaurant. Aristos is in the photograph above. Fish is their thing they are most known for but they do serve up some wonderful grills as well and their steak is pretty excellent. Seafood for me though, a plate of calamari, a squeeze of lemon, those wonderful cyprus chips and a view of Pissouri Bay are a recipe for heaven to me. They also have the local organic wine (ANELYS) on the menu too. Weekends, hi days and holidays you can't move for local clientele so do book so not to be disappointed. Behind the Vineleaf Taverna but if you are not sure just ask. Once you have reached the car park area you only have a 2 minute walk. Owned by Aristos and Georgina and waitressing is done by their 2 daughters. 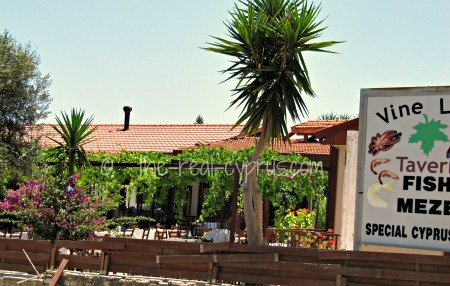 Very much local taverna food, and have only ever eaten there during the day, so cannot speak for the evening experience. They boast a very nice view from the stone covered terrace, very nice in the summer time. 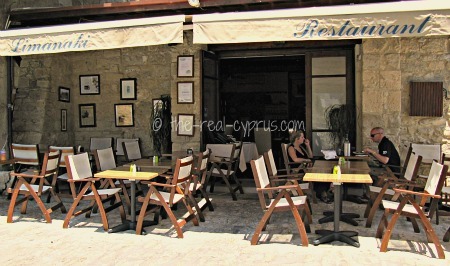 Renovated nicely with local stone in recent years and very popular as are all of the beach restaurants in cyprus with the locals at the weekend. The Liminaki Pissouri is owned and run by Sam Kazzaz, whose lebanese heritage has provided a great grounding for some lebanese/cypriot fusion cooking and has turned this space into an award winning restaurant. His restaurant is extremely popular, has a very strong reputation for quality and usually pretty booked up. It is only a small restaurant, it used to be a shop called Pepe's, a small kind of gift shop plus they sold other stuff. I remember trundling along to the shop for suntan cream, flip flops and postcards. That said, if you want an outside table, probably best to book in the summer as they will be gone very quickly. The food is of very high quality and if you have a special occasion to celebrate during your visit to the area, this would be my choice for an extra special meal. Sam also offers what he calls his charity cooking school on a Monday 10 til 12.00. So called charity because he likes to give back but also rather than take a fee for his time, he would like you to offer a donation to a charity of your choice. These places get very booked up so call ahead if you would like to include this in your holiday. Update: summer 2012 - not sure if the classes are still running. It is my understanding Sam has been quite unwell and may not be running classes, so I suggest you check first, to avoid disappointment.